Sort the beans to remove any dirt clods or pebbles and soak covered in water overnight. Alternatively, you can do a quick soak on the beans by placing them in a 4-quart pot and covering with water. Bring to a rolling boil over high heat and boil for 2 minutes. Remove from the heat, cover and let sit one hour. With either method, drain the soaking liquid and rinse the beans. Place a 4-quart pot or dutch oven over medium heat and add the bacon. Cook the bacon until it is beginning to brown and the fat has been rendered out. Drain all but 1 teaspoon of the bacon fat. Add the onion and saute until the onion is soft but not brown, about 3-5 minutes. Add the garlic and jalapeño (if using) and saute until fragrant, about 30 seconds. Add the soaked beans, water, salt, pepper and barbecue sauce. Stir well. Turn up the heat to medium-high and bring the beans to a boil. 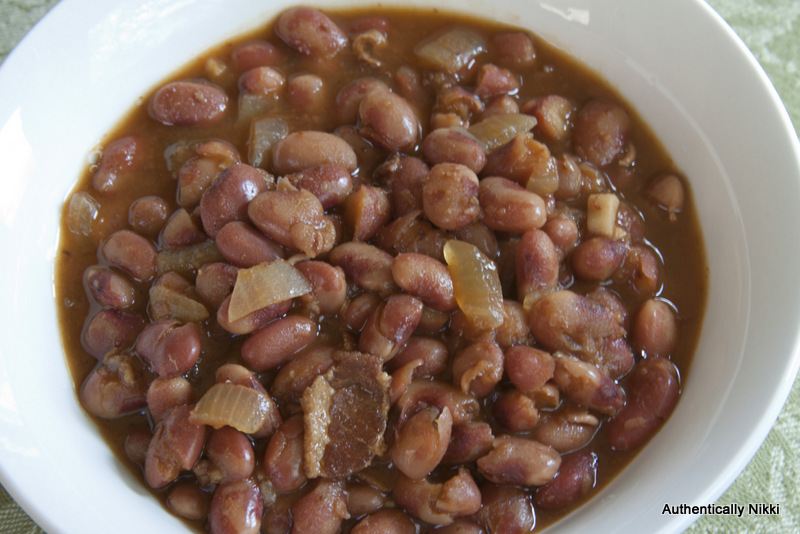 Cover, reduce heat to a simmer and let cook for 1 1/2 – 2 hours or until the beans are soft. If you are using canned beans, you can reduce the cooking time to 45 minutes – 1 hour. This entry was posted in Side Dishes and tagged anasazi beans, pinto beans by authenticallynikki. Bookmark the permalink.